The wackiest night in the the nation's capitol and CSPAN's biggest ratings grab is almost here. I'm talking about the annual White House Correspondents' Dinner, which will take place on Saturday, April 15. 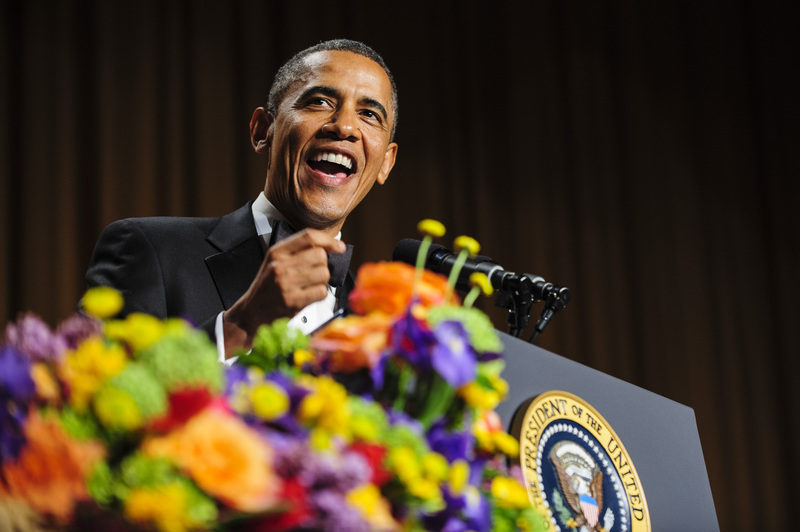 Come for the jokes and stay for the celeb sightings because there will be a bunch based on the guest list for the 2015 White House Correspondents' Dinner, or more affectionately, "Nerd Prom." Guests are invited by different news organizations, from NPR to Cosmopolitan Magazine, which makes for an odd mix of celebrities, politicians, and journalists. Don't be so hard on yourself, Washington! Still, this mix of guests is sure to make for good television. If the State of the Union Address was your informative Dad, this event is your quirky Aunt Eudora — it is an opportunity for the White House to celebrate the media and look back at the year that was in a lighthearted manner. The President and guest host comedian both speak. As we've learned over the past seven years, President Barack Obama is a difficult comedic act to follow. Cecily Strong will be fine, but she definitely has her work cut out for her. What does this year's VIP guest for the White House Correspondents' Dinner list tell us about our priorities in 2014? Quite a bit, actually. Let's get analytical before Saturday night. Sometimes, looking through the White House Correspondents' Dinner guest list is a little bit like a peek into everyone's Netflix history. Fictional power players are particularly popular. Thomson Reuters invited Michael Kelly from House of Cards as well as Jaime Lannister himself, Nikolaj Coster-Waldau from Game of Thrones. Troian Bellisario from Pretty Little Liars will be there. All the ladies from Scandal will be joining Michelle Monaghan from True Detective. You guessed it, Sarah Koenig herself will be in attendance. Which is fantastic not only because the podcast just won a Peabody Award, but because the host Cecily Strong, did a perfect impression of her on Saturday Night Live. Some poor camera man will be forced to stay on Chrissy Teigen for potential funny reaction shots all night, because she'll be there. 2014 was a great year for diversity and representation in Hollywood, no matter what some nay-sayers have to say about it. Representing the year that was in representation are Selma director Ava DuVernay, State of Affairs' Alfre Woodard, the creator and cast of black-ish (Anthony Anderson and Tracy Ellis Ross), Jane the Virgin's Golden Globe-winning star Gina Rodriguez. Naya Rivera was invited by USA Today and Glee's final season began in 2014 as well. Finally, Comedy Central's Larry Wilmore will be representing The New Yorker and hopefully scoping out the room so he can please host next year. Four actors from the ABC series will be at the dinner. The sitcom's still going strong! Two Vine stars, Marcus Johns and Nash Grier, will be in attendance thanks to the Huffington Post. In addition to that, Youtubers Bethanny Mota and Tyler Oakley as well as Snapchat star Jerome Jarre were invited. Way to be hip, Huffington Post! The magazine invited both Norman Reedus and Lauren Cohan. I never would have guessed.